Find any kind of vegetable you may need for fresh ingredients at the Cherry Street Farmers Market in Tulsa. There’s nothing quite like the rush of sweet juice that comes from the first bite of a freshly picked fruit or the heightened flavor of a vegetable straight from the farm. Oklahoma has plenty of farmers markets with a variety of vendors around the state. Take advantage of food at its ripest and stock up on your favorite mouthwatering berries and more at the top farmers markets we’ve outlined here. Find a wide variety of treasures at the OSU-OKC Farmers Market right in the heart of Oklahoma City. If you’re on the hunt for fresh produce, then you’re in luck - over 30 vendors pack this farmers market consistently. Pick up everything from tomatoes to peaches as well as Oklahoma made cheeses, organic beef available on the first Saturday of the month, home goods such as herbal soap and hand-crafted baskets, fresh baked bread and certified organic eggs. Celebrate everything made and grown in Oklahoma at the Cherry Street Farmers Market, Tulsa’s oldest market for fresh produce. With all Cherry Street Farmers Market offers, you can make everything from a delicious spinach and pecan salad to bacon-wrapped lamb burgers with what you find. Don’t forget to pick up a jar of honey, a few nursery plants for your house and some artisan bakery products while you’re in their festival-like atmosphere. Downtown Edmond becomes the place to be during the Edmond Farmers Market, held twice a week from May to October. With rows upon rows of green beans, onions, potatoes, squash, corn, fresh cut flowers and much more, you won’t know where to begin. Chances are you’ll walk away with a few bags full of one-of-a-kind products you can’t pass up including wines, pastas, specialty teas, peaches and even some Oklahoma made treats for your canine friend. The Owasso Farmers’ Market is all about healthy living, locally grown food and bringing the community together. Come be a part of the town’s farmers market and hear some great local musicians while picking up natural meats, herbs, cabbage, zucchini, seasonal berries and handcrafted jewelry. Look for certified organic growers selling the freshest products to have a taste of Oklahoma agriculture at its best. Chances are you’ll walk away with a few bags full of one-of-a-kind products you can’t pass up. You can be sure your loot from the Stillwater Farmers’ Market in Strickland Park is locally grown because the market requires that all vendors grow their products in neighboring counties. The market, which began in Stillwater in 1986, is now a year-round source for a wide variety of products. Snack on some glazed pecans while you browse through English peas, sunflower sprouts, radishes, roasted chiles and fresh eggs. 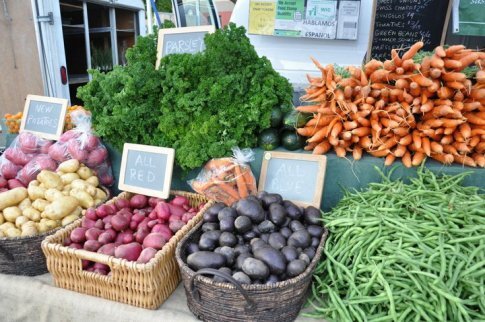 Health-minded eaters can descend upon the Latimer County Farmers Market in Wilburton twice a week to keep their cabinets stocked with good-for-you foods. Take a look at the long list of locally made cheeses before heading over to the produce section for ears of corn and jars of jellies made in Oklahoma. After filling up your car with greens and juicy fruits, treat yourself to a sweet fried pie made at a nearby community center. Creative cooks are invited to take their pick of all the fresh produce available at the Woodward Farmers Market. Search through the bountiful harvest shared by local farmers to find the freshest ingredients for your next dish before moving on to less traditional farmers market vendors. From handmade wreaths and potted plants to gardening supplies and ranch items, visitors can find it all in Woodward. Shoppers flock to the Hugo Farmers Market to visit the many vendors that offer their wares daily in Hugo. Join this group of passionate farmers, and leave with a proper supply of purple hull peas, okra and tomatoes. With low prices for locally grown goods, shoppers are sure to leave with juicy watermelons, plump peppers, crisp cucumbers and sweet blackberries delicious enough to keep them coming back for more. Ardmore Market Place on Broadway grants shoppers the chance to discover seasonal goods. With an indoor location, this Ardmore farmers market remains open throughout the year, offering an ever-changing lineup of seasonal fruits and vegetables. Come inside to escape the heat or cold while picking out locally harvested nuts, herbs and produce, as well as Made in Oklahoma baked goods, soaps and lotions. Support local growers with a trip to the Enid Farmers Market, and have a chat with Oklahoma ranchers, farmers and artisans. This well established Enid market has connected vendors with the public since 2008, encouraging the exchange of cash for locally-raised meat, farm fresh eggs and more. Stop by on Saturday mornings from May through October to find seasonal gourds, okra, eggplant and tomatoes among kitchenware, handcrafted soaps and felt toys. Head west on Route 66 to search through baskets full of ripe fruits and vegetables at the Weatherford Farmers Market in Weatherford. This old-time market consists of vendors strewn across a nearby park, selling everything from bundles of lavender to freshly sprouted radishes and turnips. Discover scented goat milk soap and heads of green lettuce during your next trip to this Oklahoma farmers market. Come prepared to stock up at the Lawton Farmers Market in Lawton. See the farm fresh foods grown and baked by locals, from canned tomatillo salsas to T-bone steaks. After sifting through the vast assortment of delicious, vine-ripe produce, be sure to treat the kids to flavored honey sticks and surprise the family dog with a peanut butter dog biscuits. See our complete list of farmers markets across the state for more options.